I guess I'm a little outnumbered here. Three to one. But I really do love it. And the boys don't seem to object to my girly touches around the house! Toby said "I LOVE those pink flowers! They're BEEYouutiful!". Maybe, just maybe, one day he'll remember that girls like flowers, and some lovely lady will be thanking me :) wow. So weird to think about that! I couldn't resist these lovely fluffy carnations! 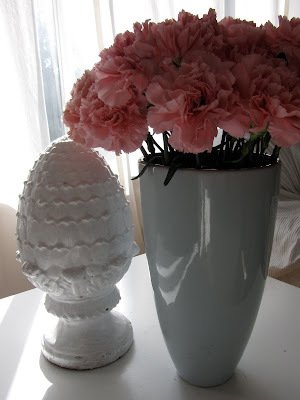 Why is it that carnations are such an underrated flower? Is it because they're not pricey? I think they're quite delightful...and they last forever! Much longer than most cut flowers. This little crystal salt cellar is something my granny gave me the last time I was at her house in Ireland (2 years ago). She really wanted me to have something that was special out of her dining hutch :) I love it so much! I made these little bird's nest cookies last night for my little nephew's baby shower. I think they turned out quite well for the 10 minutes (literally) it took to make them. I got the recipe here (and then added Cadbury mini eggs while they were still warm). In a house full of boys, this is the type of thing you find in your white-with-pink-flowers living room...a fort! 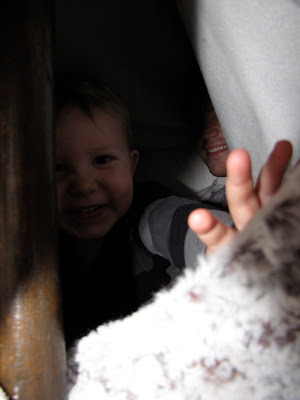 And inside the fort....one small boy...and one "big strong grown-up boy" (Toby's words). I think you've given me a new appreciation for carnations! They look so pretty I mistook them for peonies. Kudos to you for incorporating girlie touches in your house of boys! That fort is too funny and the cookies look yummy! Did you get your pouf at The Cross? I have a pink one that I ordered online from them, have never yet been to the store though, soon I hope. love love love your blog!! just popped over here from Samantha's blog and saw your fun vintage plates!! I have to get those pens! wow!! thanks for all of your inspiration!! ive always secretly like carnations too!! their stems are like wire that never goes limp!! cool forts! and yes the birdsnest cookies look amazing! Oh tracey..how funny are your boys...just adorable! And agree..carnations are underrated...I think they are lovely!! Thanks for your sweet words on my blog. As soon as I saw your white room I knew we had something in common. A love for all things white. I will be spending some time peeking around your blog and getting to know you today. Your boys are just adorable, drool and all. i really want to know how the slipcovers are with the two boys. i look at our awful mess of couches and thank my lucky stars they are brown and much of the disaster is camoflaged away...does it stress you out to have white? or is that just a silly feeling of my own? So pretty! I agree carnations can be underappreciated. I can't wait to look through your archives, I think we have similar styles! Love the white couches, and aren't they easy to wash with little ones? I love slipcovers. Thanks for the sweet comments you left on my blog! i love your chalkboard wall, i would love one like that in my kitchen but i dont have a good spot so the kids playroom will do - and they have so much fun with it. 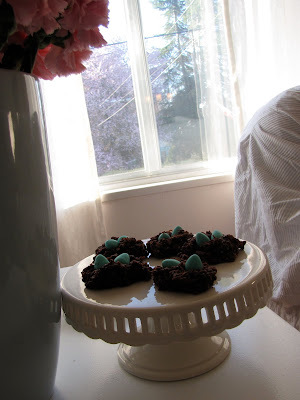 Those birds' nests cookies are so cute and springy! And I LOVE the grey pillows pictured in your blog header ~ did you make them? If not, where did you purchase them from? I'm currently on the hunt for new throw pillows for our LR couch and those would be perfect! Hello darling thanks so much for visiting my cottage and for the kind comment you left behind, much appreciated. Luv, your blog is bursting at the seams with creativity, colour and beauty. I am delighted that our blogs crossed, now I have a lovely world to visit on daily basis. WOW, i love YOUR style!! all that white and pink! don't you just love anthro? good thing there isn't one near me, otherwise i would be broke. i jave to make do with shopping on line or bribe the hubby to drive me to seattle!! Love the branches, and talk about MAJOR BROWNIE POINTS, man he's in good for a long time right. Hope you are having a beautiful Spring day.